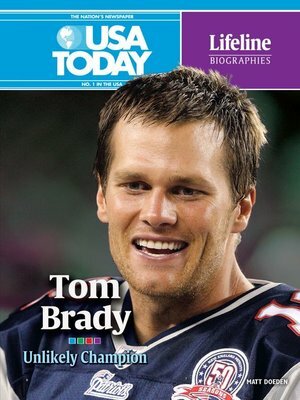 As quarterback of the New England Patriots, Tom Brady is the most important player on the NFL's best team. As USA TODAY, the Nation's No. 1 Newspaper, puts it, "Facts are facts. In winning three Super Bowls from 2001-04, among numerous other shining accomplishments, New England secured its place as the NFL's Franchise of the Decade." With three Super Bowl rings and a rich contract, Tom is on top of the world. But most people didn't expect Tom to be a big success in the NFL. Playing college football for the University of Michigan Wolverines, Tom sat on the bench until his junior year. After college Tom was taken by the Patriots in the 2000 NFL Draft—in the sixth round (199th overall). Expectations were low, but it didn't take Tom long to show that he was not just good enough to be in the NFL, he was good enough to be one of the NFL's best. Tom Brady went from a kid with an uncertain football future to one of the most celebrated quarterbacks in NFL history.